Frantic last harvesting of tender plants is in full swing. It’s always tempting to leave things until the last moment, especially these days when the climate is so unpredictable. Used to be that frost date meant frost date but now it could be weeks or even a month later than the normal frost prediction date. The frost date is taken as a averages of when the frost has appeared in the past, its not totally accurate but for most years its been pretty close. However with the constant climate changes these predictions are becoming more of a guess and frost dates can be way off. This year the first frost date for our area should have been October 15th but we had weather in the 80’s after that. Moving plants to a ‘warmer’ location at that time would have fried the poor little guys. It’s the same with vegetables. On our farm peppers are still flowering right up until the frost every year. There is no point harvesting them, ‘just in case’ it could be weeks before the frost hits and a lot more peppers could be enjoyed. Same with other crops. So we leave them. Then the frost warning comes through the national weather service and there is a mad scramble to get everything harvested before the frost hits. From experience we know what plants will survive a mild frost and those that wont. All the peppers need to be harvested, the semi tropical leaf plants like Manihot and roots of things like Jewels of Opar. It’s a lot of work and our cold storage is stuffed to overflowing by time we have finished. Any crops that we still want to hold onto after the frost need to be covered in floating row fabric. This can either be draped directly over the row or made into a kind of tent structure if the plants are tall. You can do this yourself in your garden if you have crops or plants that you want to protect. 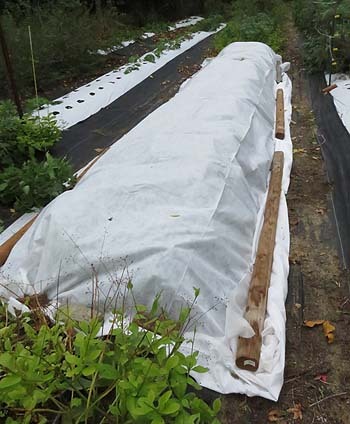 Many places sell floating row cover or if you only have one or two plants you can cover them individually with plastic shopping bags. Weigh them down with stones or other heavy objects so they don’t blow away in the wind. Once the frost has gone the bags can be removed. This is only supposed to be a temporary measure to keep the plant alive until you can do something with it. Or in the case of crops for a few weeks to either extend the length of the growing season or to protect crops that have not yet finished fruiting. This year for us its green beans. We planted a late set of green beans because we ate so many of them this year, and we sold some too. We realized we would not have enough for the family through until next season so planted a late crop. These have not yet finished maturing so they will be protected until the beans are ready. Every year we protect the Cape Gooseberries. These plants grow tall and always continue to flower right into the frost. There are a lot of fruits that wont mature but a lot that will if give a little more time. Next year I want to put up a hoop house over them and extend the season even further, but we don’t have time this year. 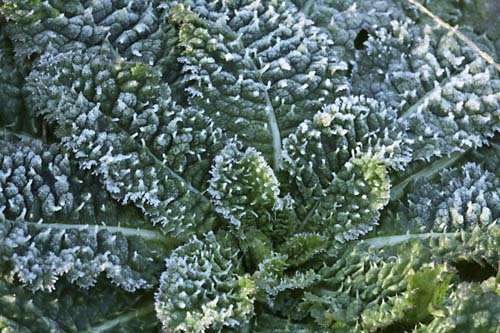 Of course this is just a mild or light frost or freeze, down to 32°F (0°C). It will kill tender plants but most of the hardier ones will be fine until we get a hard or killing frost that goes down to about 24°F ( °C). This will kill off everything. Long range weather forecast is not predicting this for at least another month, maybe more so we have time to harvest the rest of the leafy greens and the root vegetables and herbs before the ground freezes. Knowing when your first frost date is in important to any gardener. If not it can be really disappointing to go outside and find all your tender plants wilted down and dead. Keeping and eye on the weather and listening for reports of frost is always important. Learn when the frost dates are for your area. The Farmers Almanac has a nice clickable map to help you out. Previous Previous post: Now is the time to plant garlic. Next Next post: The Great Pumpkin Splat!